Despite accusations of religious discrimination and harassment by individual Food Service workers, employees seem to be content with ARA's management practices, recent interviews reveal. A current Networks employee, who insisted on anonymity, accused the management of treating its employees badly. "People aren't being treated right; a little publicity would shake [the management] up," he said. "The kitchens are very crowded during the morning rush hour; boxes are all over the place blocking passageways; there's a lot of grease on the floor and workers have slipped and fallen. The supervisors should see that these things don't happen," he said. 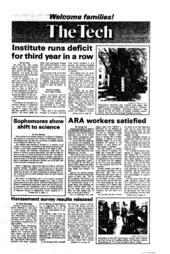 Alan R. Leo, general manager of MIT Food Services and an employee of ARA, said, "We do have accidents. The kitchens use oil and fats and liquids and there are undoubtedly going to be greasy floors. But employees are issued non-skid safety shoes. I am not happy about slips and falls, but they happen and we have to work extra careful." Not all employees have complaints about ARA. Michael L. McComas '91, an employee at Morss Hall in Walker Memorial, can find no discontent among workers there. "Lately, I don't know of anyone who is grossly unhappy at Walker," he said. McComas added, "A lot of how employees feel depends on the managers at each dining hall. Each manager is different." The new manager at Lobdell Court, Edward V. Cogliani, who began just a week ago, is optimistic about working conditions there. Cogliani said, "Given any big organization, there are bound to be people who are unhappy. So far I've found no problems, but I am willing to work with the employees." Another worker, who until recently made sandwiches at Lobdell Court, said, "One of my friends who had been a cook at Lobdell for five years was demoted and finally he quit. I know times are hard, and the ARA had to let some people go, but they are making a lot of money. They have closed down many services and the students, along with the workers, are the ones who suffer." Just the fact that most workers are afraid to air their discontent upon fear of losing their jobs says something about the relationship between labor and management, she said. Other complaints include an unresponsive union that does not really represent the workers. "They are taking union dues, but the shop stewards don't give anything in return," the Networks employee said. The Lobdell employee complained of religious discrimination, saying that as a Seventh Day Adventist, she wanted to attend church instead of working on Saturdays. She said her minister wrote a letter to MIT Food Services explaining that she would like her work schedule altered according to her religious principles. "But they [Food Services] did nothing. They never even acknowledged my request," she said. Leo also spoke about the Saturday scheduling request made by an employee, "I am sure if she requested a schedule change she got an answer. I guarantee it that she got an answer. But we have an agreement with the union about scheduling. We don't make schedules based on what each person necessarily wants for a schedule." "Our contract with the union says that management has the right to schedule. Take this example. I have so many jobs. This is the job I have for you at such a time. But you say I can't work then. . . . The complexities involved in making schedules are too difficult to suit everyone," Leo said. Leo speculated at the complaints of the employees, "They've probably gone through the process and haven't got the answer they wanted. There is a process in place. If you have a grievance, you fill out a form stating your problem, you sit with the manager and your union representative, and you work things out." "There are several levels you can go through to get your problem solved. The union agrees with us that the management has the right to set schedules, so that's why they are still complaining. The process exists to help and protect the employees. The ones with complaints have used the process and they just didn't get what they wanted," he added.